A diocese is the local Catholic Church, a miniature of the Universal Church, and full expression of Roman Catholic Christianity in a given area. United in the faith and traditions of the Roman Catholic Church and empowered by our Baptism, we are called to continue the mission and ministry of Jesus Christ in our area. Our collaboration with St. Rose in Freehold, St. Thomas More in Manalapan and St. Joseph’s in Millstone to strengthen and enliven our parishes by sharing efforts, programs and resources. Share your food with the hungry and open your homes to the homeless poor. Give clothes to those who have nothing to wear, and do not refuse to help your own relatives." 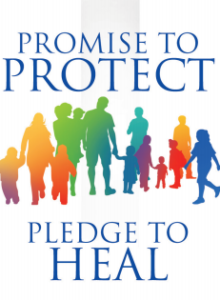 Protecting God's Children - Making the Church a safe environment for all, particularly children and at-risk adults, is a major priority of the administration and staff of Saint Robert Bellarmine Parish Family. Please take a look at the posters and "Safe Environment & Standards of Conduct Policy" that are posted on the bulletin board in the Parish Center. If you have any questions or would like to learn more about how to make our church, homes and community safer, please contact our Safe Environment Coordinator, Lisa Clarke at 732-462-7429, ext. 122 or lclarke@strobert.cc. To report the sexual abuse of minors call the diocesan hotline 1-888-296-2965 or email abuseline@dioceseoftrenton.org. Please note: The Diocese of Trenton reports any allegations of sexual abuse to the appropriate law enforcement agencies. Anyone with an allegation is also encouraged to provide that information to local law enforcement authorities. © Co-Cathedral of St. Robert Bellarmine | A Parish in the Diocese of Trenton All rights reserved.